Little Cedar Mountain doesn’t know we exist. Across the vast expanse of geologic time, our individual human lives are just tiny flashes of light, fireflies against a universe of stars. In that single instant in the lifetime of a mountain, we are born, grow old, and disappear. I’m thinking about these things as I hike the four-mile loop at Little Cedar Mountain Trail, a short drive from my home in Chattanooga. Unlike Lookout and Sand Mountains nearby, Little Cedar has lost the sandstone cap that once protected its bedrock. The limestone beneath, a cemented mix of corals and fossilized sea creatures, is vulnerable to time and weather. In comparison to its peers, the mountain seems worn down, melted away, like a once-mighty glacier in retreat. I sometimes feel the same about myself. I am no longer young and spend much of my time running, paddling, and cycling, irrationally hoping not to get any older. Try as we may to keep our world still, the Earth turns. Just more than 200 years ago, the southern Appalachians belonged to the Cherokee. The area here at Little Cedar was central to one of their great warriors, the war chief known as Dragging Canoe. This was his homeland, his country, his America. Tall and imposing, his face scarred by smallpox, Dragging Canoe was a man who never acknowledged defeat. As a boy of 12 to 14 years of age, intent on joining a war party, he was told he could take part if he could carry a canoe. He was too small to lift the boat, but instead dragged it across and became a young warrior. As he grew into a leader of his people, Dragging Canoe watched an unstoppable tide of white settlers flowing into their land. For generations the Cherokee had hunted game across vast regions that belonged to all; now the “Virginians,” as he called them, were subdividing that land into tracts owned by individual farmers who cultivated crops and animals. Dragging Canoe’s father was a famous peace chief, a negotiator of treaties that surrendered territory for promises that the remainder of the land would forever belong to the Cherokee. For Dragging Canoe such agreements were only temporary reprieves that pushed his people west toward extinction. He and his young warriors would hold the land, he said. Splitting from his father and the other Cherokee, Dragging Canoe moved his people to South Chickamauga Creek near Chattanooga and began a series of bold assaults. His warriors attacked forts and other large targets, but they were also known to ambush isolated families. The white government responded with massive retaliations in which hundreds of militia moved like floods through the valleys, capturing or killing any native inhabitants they found, burning villages and crops. 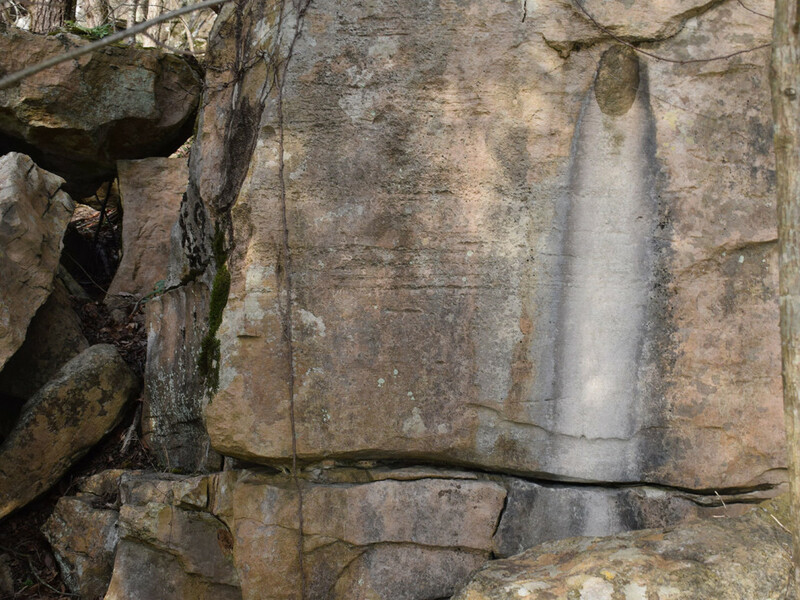 When the Chickamauga towns had been twice burned, Dragging Canoe moved west into the more remote region near Little Cedar Mountain. He made his home at Running Water, near the mouth of a creek where Interstate 24 now crosses the Tennessee River. From that village, he fostered alliances between the British, the Spanish, the Creeks, and other tribes to push the settlers back. From 1776 to 1792 Dragging Canoe waged war. He fought not just for the land but for a way of life that was changing beneath his feet. He ran all risks, incurring all consequences. Dragging Canoe died in middle age not in battle but at home from illness and exhaustion after an all-night celebration of a victory. His warriors fought on for a time until the towns of Running Water and Nickajack just downstream had been burned and abandoned, until his people accepted what he never could. The Cherokee assimilated, tilled the soil, and grew prosperous, but the hunger for their land remained. In 1830 President Andrew Jackson succeeded in passing the Indian Removal Act. Four years later, despite a Supreme Court ruling in their favor, the Cherokee people were dying on the Trail of Tears as they marched toward the empty spaces of Oklahoma. The white settlers did not lay permanent claim to all they appropriated. In modern times the Tennessee Valley Authority invoked eminent domain to take the land yet again. In 1967 the gates closed at Nickajack Dam, and the lake crept up the valley—turning Little Cedar Mountain into a peninsula. The forgotten sites of Running Water and Nickajack disappeared beneath the water. 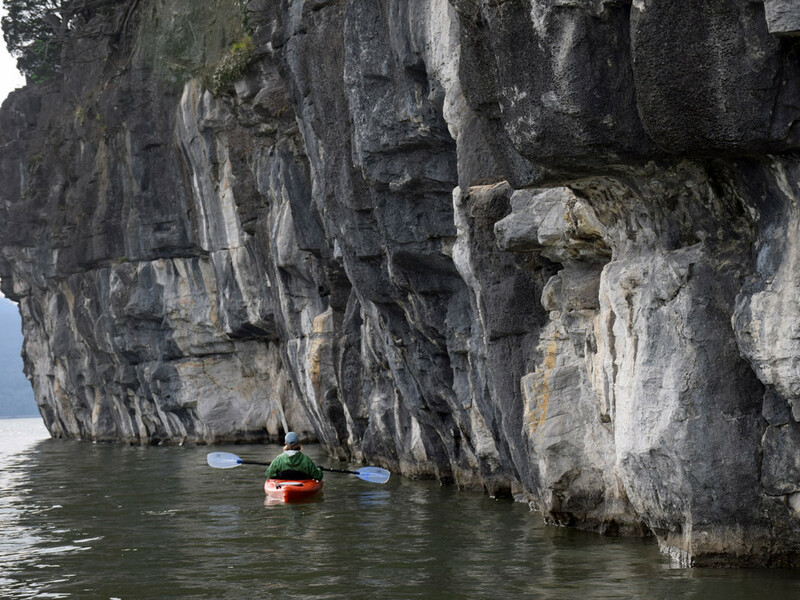 Thirty years later, TVA proposed selling the shoreline back to private developers but was stopped by Native Americans and sportsmen who wanted the land kept wild. It was another short-lived victory. In 2004, after TVA traded it for other tracts nearby and 600 prime acres adjacent to the mountain were sold to a developer for an upscale community. The developer sold the lots but diverted the proceeds to other real estate ventures. A few homes were built, but today the lots remain almost entirely vacant. The mountain itself, now completely surrounded, remained public land. The air is still as I cross a footbridge and enter a pine forest just shy of the failed development. The trail leads past limestone mounds and pillars standing like tombstones on the slope above. 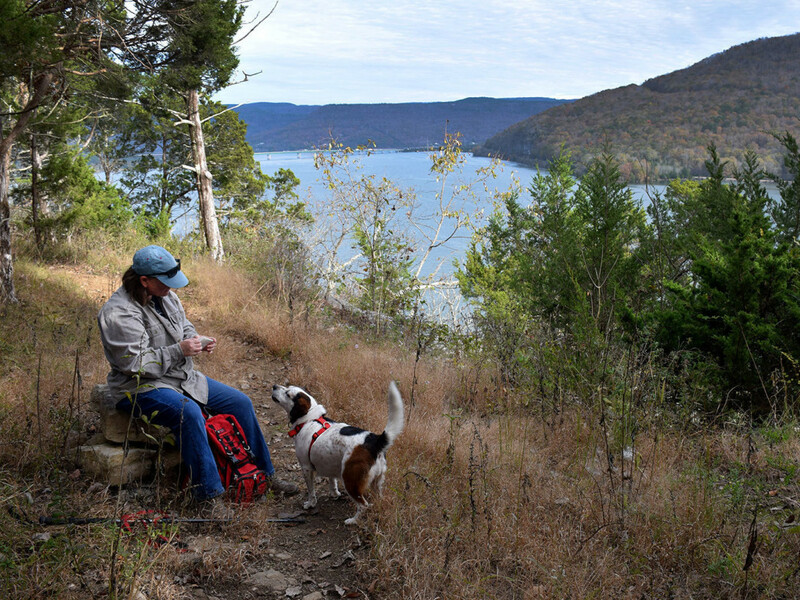 At the half-mile point, the path climbs up and over the hillside. I see fractured ridges of limestone all around me, as if the bones of the mountain have been left rudely exposed. The trail follows the edge of the water for a short distance, the gentle lapping of the water competing with the distant sound of trucks on the Interstate. Leaving the water, I climb again to regain the top of the hill in an area marked by sinkholes, the internal decay of a mountain slowly being consumed. 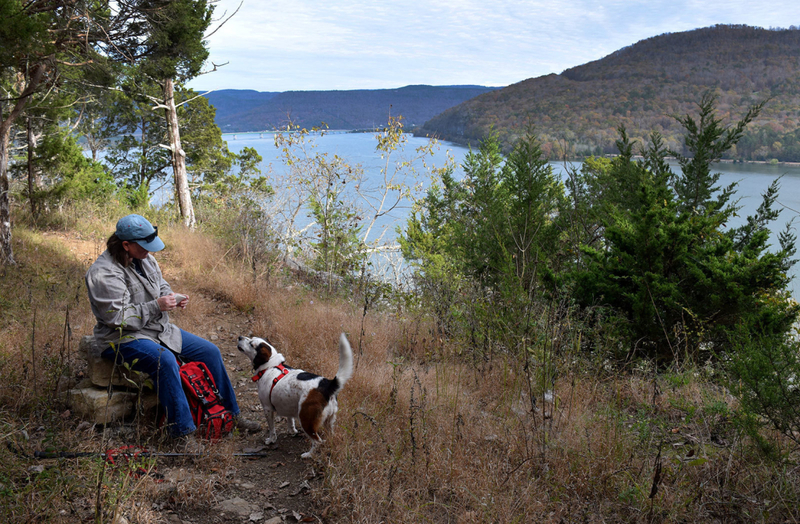 Soon I come to the top of Grays Bluff, overlooking the lake with Sand Mountain painted like a portrait behind it, a beautiful place for contemplation. To the north, framed by cedar trees, I can see the long bridge on I-24 that leads past Running Water. I watch a bass boat come down the river, trailing a long v-shaped wake. I know the boat is traveling fast but from this distance it seems to crawl as an airplane does when it crosses the sky. What would Dragging Canoe think of the lake that covers his valley, of the Interstate that slices through it? I’ve come here seeking a connection to his world, the sacred ground of the Cherokee where spirits dwell in every rock and tree, but I doubt I can ever know this place as he did. Does the spirit of the river still live down there so deep under the lake, where the waters once flowed? Over two centuries after he walked here, how can I hope to understand a man whose name translates to, “He is dragging his canoe,” a relentless warrior who had such purity of conviction yet lost everything he sought to defend? I stand for a long time, listening. A train is rumbling down the tracks on the far bank of the river. Crows squawk in the trees. Across the water to the west, from the emptiness of the undeveloped lots, comes the drone of mowers cutting the grass in front of houses that don’t exist. I start walking again, until gradually the crescendo of the Interstate fills in. Seasons flicker past, years flow by, and we will incur the consequences. The water rises slowly around us. Everything we have built—our towns and encampments—will disappear, but the mountain remains. As Dragging Canoe and so many others have done, we will hold this land, knowing all the while that one day it will let us go.